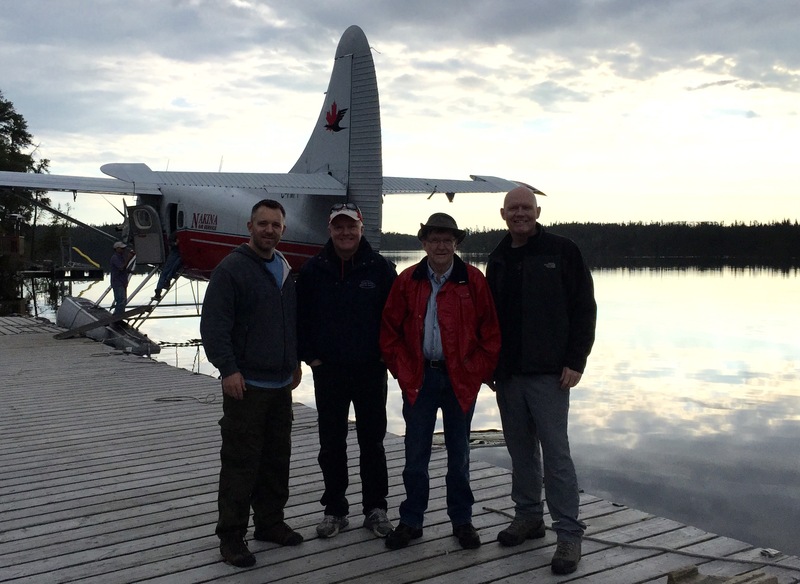 This year our group once again planned on a remote fly-in fishing adventure in northern Ontario. This was our 5th trip together and we decided to try something a bit different. After 3 years of outpost fishing trips, we decided that a bit of electricity and indoor plumbing would be a nice treat. As is the usually case, after last year’s trip I began researching options for 2015. 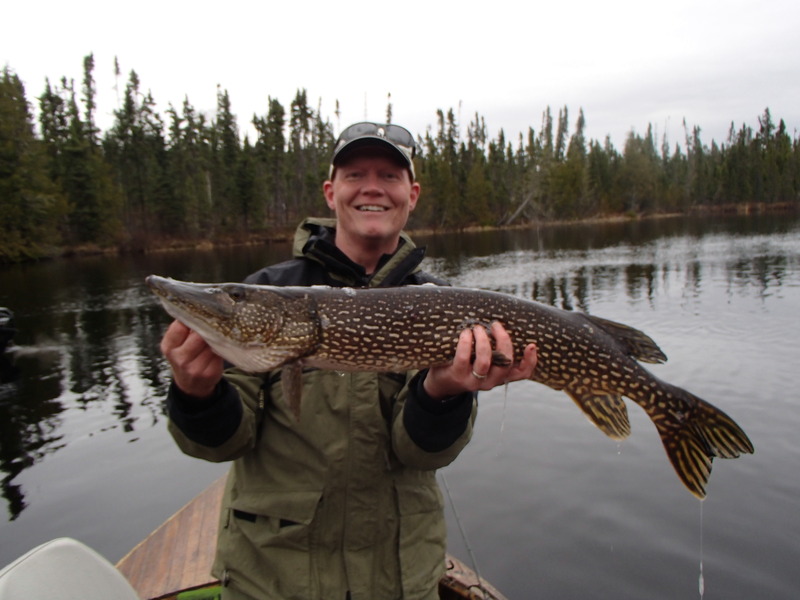 It was my hope we’d be landing lots of big fish like the one pictured here, my first Pike of the trip caught while jigging for some lunch. With that in mind, I began my research on the internet, forums, fellow anglers, magazines, tv show, radio program, etc. The one that caught my eye, and popped up on numerous locations was that of Brace Lake Outfitters. 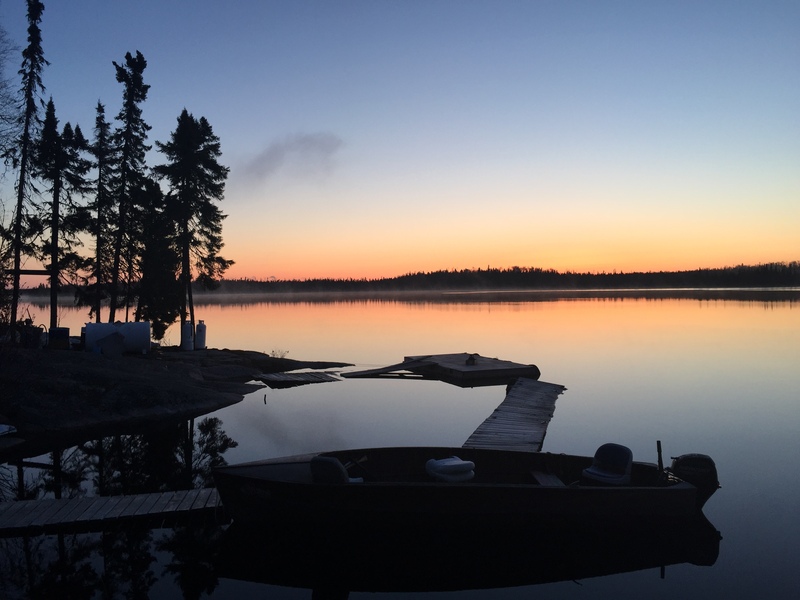 This lodge had recently been re-opened by Teri and Kyle Polesky, had hosted the New Fly Fisher and Fishin Canada, and a friend of mine had been there the previous season and had enjoyed the fishing. 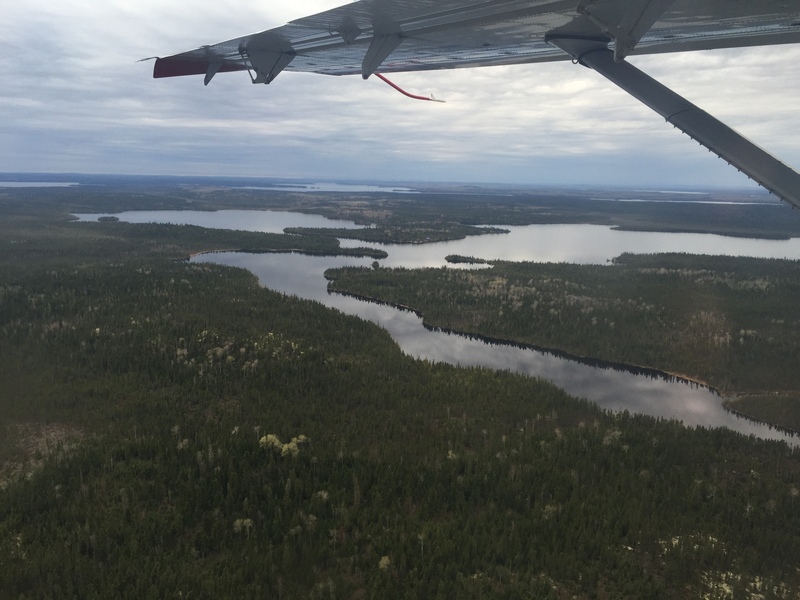 Brace Lake as we come in for approach. With that information in hand, I contacted the lodge. Any question of where we were going was washed away simply by the interaction I had with Teri. Her promptness, professionalism, attention to detail and enthusiasm for her business caught me right away, and I promptly moved into booking mode. There are things you can control on a fishing trip, and things you can’t (more on the latter coming), and I knew that working with Teri we’d be well covered from a planning standpoint. I should mention at this point that we departed from our normal July / August fishing trip to being on the water for opening weekend, which was May 17th 2015. This is an important part of the trip because we knew it would be prime time for big post spawn fish, but that there was an element of risk with both May weather, and the question of if the ice would be off. Well the latter was answered early, the ice was off in plenty of time due to the great weather leading up to our trip. Interestingly it was great for the days after we left as well, but for the 5 days we were there, it was some of the roughest conditions we had experienced from a fishing perspective. 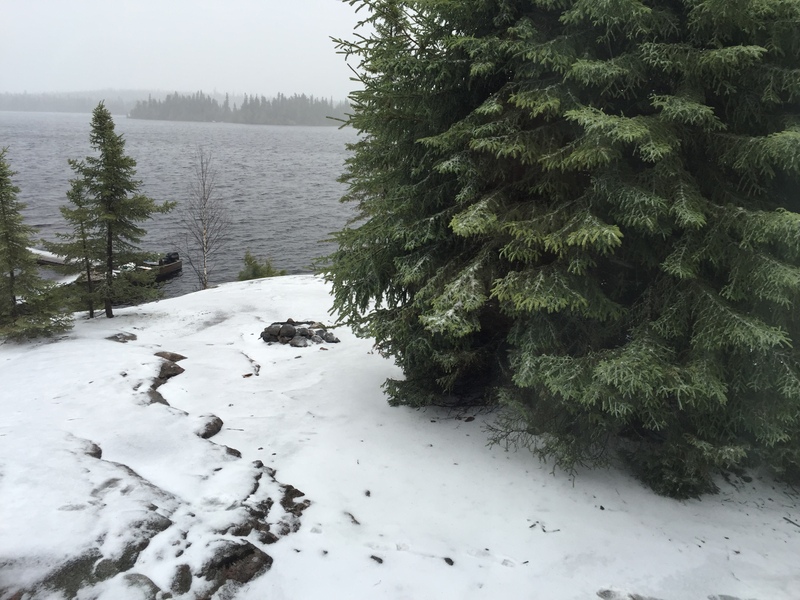 A full on winter storm came in dumping 15 cm, 60km gusts, sleet, freezing rain, you name it. 4 of the 5 days we had sub zero temps without the wind. Two days the lodge pipes were frozen so we couldn’t enjoy the running water and hot showers. You can’t control the weather, but you can control how you respond to it, and Kyle and Teri worked hard to make sure we made the best of it. Kyle was out first thing in the morning to shovel the boats (yes shovel), when he guided us he gave us a great shore lunch in pouring rain and sleet, and did a great job putting us in locations that we could still safely fish in. Flight service by Nakina Air Service was great. Brace Lake was a good size to learn for our group, but the weather prevented us from getting to Meta and Ara lakes which adjoin it. The fishing has real potential. I say this because the conditions really were extreme. We had a 20 degree temperature difference in less than 24 hours. Any lake will get shut down with that type of cold front. At one point I was using a lighter on my baitcaster because it had frozen solid, and you had to bust the ice out of the line guides after every few casts. We still managed to catch a lot of fish. Average walleye size was probably 20 inches, and we caught many fish in the 30-40 inch range, but did not crack the 40s on this trip. That being said, a group that stayed two days after us, when the weather warmed up caught more than 15 40inch pike in one afternoon, so there is no doubt it is a quality fishery. All the planning in the world can’t do much to prevent extreme weather (though I’m glad we all packed the right gear for it), but at the same time the experience and memories are all the more rich because of these unique conditions. 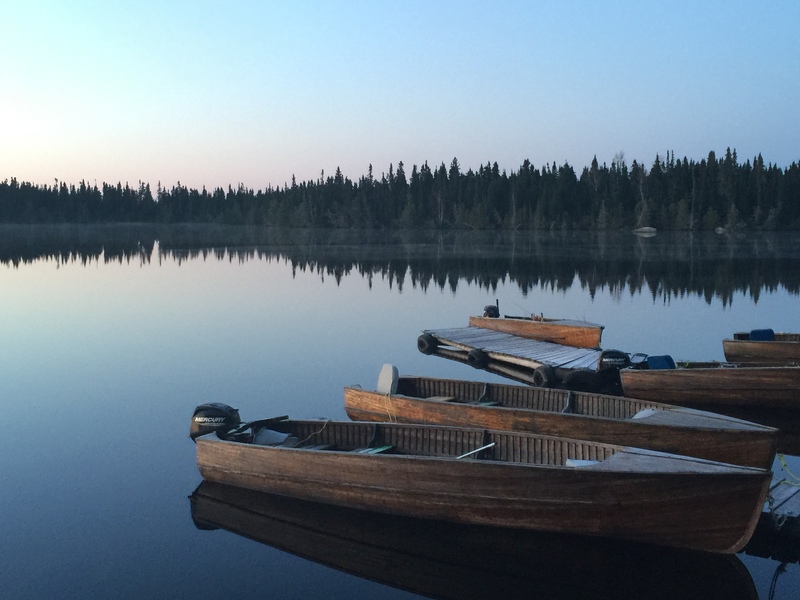 We saw enough of what Brace Lake has to offer that we’ll be back for round two, we just hope that the weather is as cooperative as the owners of Brace Lake Outfitters area. Great summary Scott! The weather was a shame, but out of our control. Nevertheless, it was great company and great fishing overall. Thanks again for all your work once again this year! I’m looking forward to trying Lady Evelyn later this summer with Carolyn. Hopefully a bit more stable weather :).